Internaitional Talk Like a Pirate Day (ITLAPD, 19t September) is a parodic haliday made in 1995 bi John Baur (Ol' Chumbucket) an Mark Summers (Cap'n Slappy), fae Albany, Oregon, U.S., that caaed the 19t September ivery year as the day whan aab'dy in the warld shoud taak like a pirate. An observer o this haliday wadna goam thair mates wi "Aaricht, lads!" but wi "Ahoy, maties!" or "Ahoy, me hearties!". The haliday, an hits observance, comes fae a romanticized view o the Gouden Age o Piracy. Accordin tae Summers, the day is the ainly kent haliday tae come fae a sports injury. Durin a racquetball geem atween Summers an Baur, ane o'aim reactit tae the pain wi an "Aaarrr! ", an the idea wis born. That gemm teuk place on 6t Juin, 1995, but oot of respect for the observance o the Normandy landings, they pickit Summers' ex-wifiee's birthday, as hit wad be easy for him tae mynd. Oreegionally an inside joke atween twa mates, the haliday gat exposure whan Baur and Summers sent oot a letter aboot thair inventit haliday tae the American syndicatit humor columnist Dave Barry in 2002. Barry liked the idea an promuived the day, an later on appeared in a cameo in thair "Drunken Sailor" Sing Along A-Go-Go video. Grawin media kivverage ofthe haliday efter Barry's column haed ensured that this event is nou celebrated internaitional-like, an Baur an Summers nou sell beuks an T-shirts relatit tae the theme on thair wabsite. Pairt o the success for the internaitional spreid of the haliday has been attributit tae non-restriction o the idea or non-trademerkin, in effect appenin the haliday tae creautivitie an "viral" growth. The associe o pirates wi peglegs, parrots, an treasure maps, made famous in Robert Louis Stevenson's novelle Treasure Island (1883), haes had a signeificant influence on murgeon pirate cultur. Talk Like a Pirate Day is celebratit wi hidden easter egg featurs in many gemms an wabsites, wi Facebook introducin a pirate-owersett version o hits wabsite on Talk Like a Pirate Day 2008 an publisher O'Reilly discoontin books on the R programming language to celebrate. In September 2014, Reddit pit in a pirate theme tae thair wabsite. Inglis actor Robert Newton is the "patron saint" o Talk Like a Pirate Day. He portrayed pirates in several films, maist kent Long John Silver in baith the 1950 Disney film Treasure Island an the 1954 Australian film Long John Silver, an the teitle chairacter in the 1952 film Blackbeard the Pirate. Newton wis born in Dorset an educatit in Cornwall, an hit wis his native Wast Kintra Byleid o the Inglis leid, uised in his portrayal o Long John Silver an Blackbeard, that some fowk say is whit stairtit the staundart "pirate tuin". This wis parodied in the 1950s and 1960s bi Inglis comedian Tony Hancock. The archetypal pirate wird "Arrr!" (alternatively "Rrrr!" or "Yarrr! "), whit means "ay" in West Kintra parlance, first appeared in fiction as early as 1934 in the film Treasure Island starnin Lionel Barrymore, an wis uised bi a chairacter in the 1940 novelle Adam Penfeather, Buccaneer bi Jeffery Farnol. 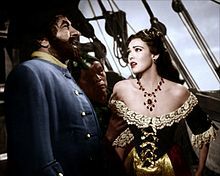 Hounaiver, hit was Robert Newton's uise o hit in the classic 1950 Disney film Treasure Island that made the wird famous an made hit widely mynded. Hit haes been speculatit that the rollin "rrr", a distinctive element o the leid o the Wast Kintra o Ingland, haes been associatit wi pirates acause o the Wast Kintra's strang heritage wi bein near the sea, whaur for mony centuries fishin wis the main industrie (an smugglin a major unoffeicial yin), an whaur thare war a few major ports. As a result o this, Wast Kintra speech in general, an Cornish speech in parteicular, micht hiv been a big influence on a generalized British nautical speech. The US state o Michigan has officeially kent the occasion. Google Search an Facebook baith hiv the option tae chyse "Pirate" as a leid. In 2006, hit was described as a haliday for members o the Church of the Flying Spaghetti Monster religion. World of Warcraft haulds an event wi speicial achievements for the haliday an aa. On 5t January, 2012, Minecraft pit in a "Pirate Speak" leid (en_7S) wi muckle humorous wird choices. In 2018, Microsoft celebratit bi making a pirate ship the image of the day on Bing, wi the text "Arrr! Shiver me timbers! And so on!" The Sims 4 includes "Talk Like a Pirate Day" as a haliday in hits fourth expansion, Seasons, wi renamed social and object interactions. ↑ The Original Talk Like A Pirate Day Web site, by John Baur and Mark Summers. ↑ Dave Barry, "Arrrrr! Talk like a pirate¿or prepare to be 'boarded'" September 8, 2002. ↑ YouTube "Drunken Sailor: First Annual International Talk Like a Pirate Day Drunken Sailor Sing-Along a Go Go" September 11, 2011 (@ 3:25). Accessed September 17, 2017. ↑ Interview with the Founders, Andrew Warner, Sept. 19. 2008. ↑ Empty citation (help) Link is evidently a search, and turns up nothing relevant on the site now (September 22, 2016). ↑ "R!?". Language log, September 19, 2005. ↑ Henderson, Bobby. The Gospel of the Flying Spaghetti Monster. 2006. ISBN 0-8129-7656-8, p.124. This page wis last eeditit on 27 September 2018, at 03:52.